FINCA helps Guatemalans living in poverty access financial services to improve the quality of life for themselves and their families. 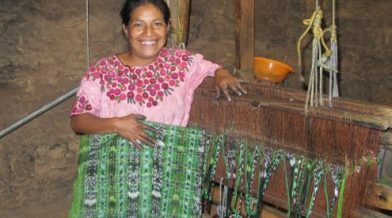 Catarina is proud to report that, as a result of taking out her Village Bank loan, she and her husband have increased their production two-fold, making it possible for them to continue to work to expand their weaving business. Guatemala is the most populous country in Latin America and also one of the poorest. More than half of the population lives below the national poverty line. Poverty in Guatemala is tied in with the country’s uneven income distribution and land ownership. Poverty is also highly concentrated among indigenous communities. About 7 out of 10 people of indigenous descent live in poverty. Guatemala has the highest rates of malnutrition in the Western hemisphere and the rural areas are especially affected. The high malnutrition rate of children is primarily due to families lacking the resources and means to provide nutritious food for their children. When poor people have access to financial services, they can earn more, build their assets, create jobs, and cushion themselves against external shocks. Since 1989, FINCA International has been helping thousands of Guatemalans improve their lives. FINCA offers financial services, such as loans and microinsurance throughout the country.